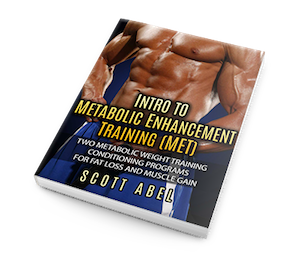 Metabolic Enhancement Training or just “MET,” was designed to improve conditioning, build muscle and induce hypertrophy, and speed up the metabolism. Many of these athletes look as though they could step onto a bodybuilding stage “contest ready” and wipe the floor with the actual bodybuilders there, all without having to diet down for months on end, or doing endless bouts of cardio! They just look great every month of the year. MET is the strategic combination of functional training movements with traditional bodybuilding training methods to induce hypertrophy, build muscle, burn fat, and increase your metabolism. 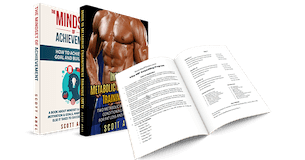 Scott’s been using it with his coaching clients for over a decade now. It’s often used in conjunction with Scott’s Cycle Diet approach for staying lean year round while gaining muscle. Whether you’re looking for conditioning, muscle growth, training for a fast metabolism or just a workout to help you get abs, Metabolic Enhancement Training can help by introducing new totally training stimuli and movements into your current regimen. This booklet is an introduction to MET, with a full and complete 4-day program, plus a “figure” variation. Included are two 4-Day MET Hybrid Programs, consisting of various sets of quad-plexes. These are training circuits where you do the first set of exercise A, B, C, and D one after the other before taking a rest, then you go on to your second set. However, with both variations of these circuit training programs, there are specific guidelines to build up to the full four exercises over a few weeks, and then to taper down again at the end of the program. (For example, you start with just doing exercises A and B in the first week.) Both versions are good for the whole body, though the figure variation was designed for female figure competitors, so there’s a bit more emphasis on glutes, capped shoulders, and that kind of thing. In these particular programs, if you want you also have full choice of exercises, so for example, for exercise A you can choose “any compound chest movement” or something. There is a list of exercises you can pick and choose. Also included are versions of both programs with all the exercises chosen for you, just in case you’re not sure or are just getting started with this kind of circuit training. This is a healthy bodybuilding or weight training program for both men and women. Get your MET training book now and get started with MET training today. Note that this book is available for free, as part of the Abel Starter Set.